The best way to learn the Dhamma is to go to a Dhamma center, temple or monastery where there are qualified teachers or friends who would be able to share the Dhamma with you. When you are there, ask someone who knows their way around the center, or even speak to another newcomer. People are usually friendly. During Q&A time, ask questions. No question is “stupid.” In the tradition of Buddhism we welcome questions and no question is considered taboo. In fact, chances are several other people in the room are wondering the same thing and hope that someone will overcome their shyness enough to ask the teacher. You may see people bowing. If you do not feel comfortable doing that, you do not have to. There is no pressure. Same with saying prayers; take your time to understand them so you feel comfortable when reciting them. As a beginner, go to the classes for beginners or attend the talks. The importance of properly understanding basic Buddhist principles and establishing a solid foundation at the beginning cannot be overestimated. If you skip around from one class to another or frequently miss classes, you will miss learning the important steps. You will hear many new ideas, some of which may not make sense to you. That is ok. You do not need to force yourself to believe them or to discard them as ridiculous. Instead, put them on the back burner and return to contemplate them from time to time. Gradually things will begin to make sense. Do not expect to understand or actualize everything all at once. Learning Dhamma is not like Western education, where we learn facts and tell the teacher what they already know on a test. Listen attentively to the Dhamma and at home, think about what you heard. Check it out logically and apply it to your life to see if it works. Contemplate the same teaching many times, because each time you do, new understanding will arise because your mind has changed. Read Dhamma books slowly, pausing to contemplate what you read, applying it to your mind. Although it is tempting to hurry to get a lot of information, principally read books that correspond with your level of practice. In this way, you will establish a good foundation and would not become confused. Buddhism is not intellectual concepts. Practice is essential to bring the Dhamma into your heart. In Buddhism. the sequence of practice is commonly taught as Generosity, Morality and Mental Cultivation. We start with Generosity first as it is an immediate cause for happiness and a mind that is softened by Generosity is more receptive to the practice. Morality for the layman requires him to observe the Five Precepts. At some point, you may wish to start meditation practice. In your daily meditation practice, begin with reciting some verses like the taking of refuge to make your mind receptive. Formal time of meditation prepares you for practicing the Dhamma the rest of your day; at work, with your family, at school, wherever. In those situations, be aware of what you are thinking, feeling, saying, and doing. Be mindful of your thoughts and emotions and try to bring loving-kindness and compassion into all your interactions with others. When you first begin to practice, you may be shocked at the thoughts and feelings you discover inside. Do not get discouraged, thinking the path is too difficult or getting down on yourself. All of us are similar; anyone who has practiced Dhamma for a while has gone through what you are experiencing and has come out the other end. Be patient with yourself. Some people find it useful to find a personal teacher. If you are comfortable with a particular teacher, this can be beneficial. However, a teacher is not an absolute necessity. The Buddha taught that the Dhamma is our true teacher and thus it is alright to learn and practise by yourself and by frequent checking of your understanding against the scriptures and texts. 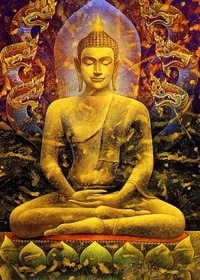 The Buddha also placed great emphasis on fellowship with like-minded persons. So if you have the opportunity, you should join a community to support and be supported by it. Cultivate friendships with people who are also practicing the Dhamma. In this way, you encourage each other to learn and practice. We get out what we put into the Dhamma. We are responsible for our own spiritual practice. No one is going to spoon-feed us. Our teachers, our community and the Three Jewels are there to guide, teach, and inspire us, but we have to do the work of transforming our minds. As we do, we become wiser, calmer, more compassionate, and clearer, and our sense of well-being increases.